Welcome to episode 021 of the Me Being Crafty podcast, where we explore creativity in your life. In this episode I talk to Jennifer Ackerman-Haywood of CraftSanity. We had a really great conversation about her creative journey, her transition from being a staff writer for a local newspaper in Michigan to writing a freelance column on art and craft, her podcast, craft magazine, and so much more. This picture is a recent shot of Jennifer working on screen printing. I’ve listened to Craft Sanity since the beginning (she began in early 2006! ), back then there were not many crafty podcasts and I had my other one for about a year so it was really great to connect with people during that time. I was happy to see Jennifer back and producing shows again after a short break, she was missed. Thanks again for being on my new podcast Jennifer! Jennifer has tried a wide variety of crafts over the years, starting with coloring books as a child and falling in love with weaving in middle school. She learned to crochet as a child because of regular family visits during which the men, women, and children were all separated to each do their own thing. Not wanting to miss out, and wanting to be like her Mom, Great Aunt’s, and Great Grandma, to be like the other women in her family, made her want to learn to crochet as a five year old. Jennifer is a story collector and her formal training in Journalism is a wonderful profession to be in with that strong interest. She was an apprentice to a master weaver for a year when she was in her early 20s and says one thing that drives her is knowing she doesn’t have to only do one thing. She is so right. We all have other interests and being able to pursue those interests and connect with people in person and online is really a fun thing. She also talked about daily practice and how that really improves whatever you are learning or working on. 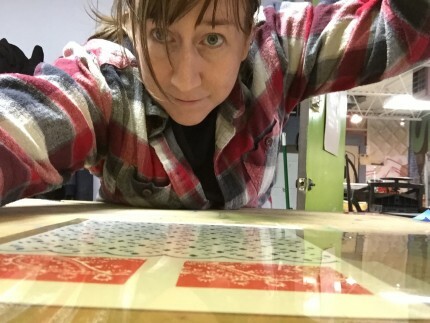 She is currently carving a block a day and also talked about testing screen printing on two t-shirts knowing she only had those two shirts at the time. It can be scary to realize that if you make a mistake that’s it, but she went forward anyway. Jennifer and her husband have two children who are also crafty kids, which is a given considering they have grown up in a house with looms and access to many craft supplies and interests. I love getting kids involved in whatever I am making and I am glad that my kids have shown interest in different crafts over the years. The screenprinted tea towels that are in the CraftSanity etsy shop were designed by one of Jennifer’s daughters and I think that is so amazing. It is fantastic when we can share what we love with the people that we love. Jennifer also mentioned ArtPrize, visit the site to find more information about this international art competition. Listen to episode 021 and let me know about the last new thing you tried. I admit it’s been a while for me for trying something new. My daughter has paints and we have a bunch of canvases for her and I was thinking that I should try painting. I’ve never done that and I’m sure it would be a fun thing to try. I have tried screen printing before and I think I want to do that again too. I need to check on my supplies and figure out where I can get more. Leave me a comment and let me know how you were creative today. Me, I’m working on a mini quilt swap. Thank you for inviting me on your podcast. It was fun chatting with you!